Discussing the two pace-of-play rule changes for 2018, MLB Commissioner Rob Manfred said he was pleased by the changes for the upcoming season, but confirmed his commitment to a "multi-year effort," stating, "I'm fan of the pitch clock." Modern baseball's pitch clock, which first made its appearance alongside several other experimental time-saving initiatives during the 2014 Arizona Fall League, has lingered as part of the pace-of-play conversation ever since and gained traction since the minor leagues' adoption of the 20-second timer for seasonal play. Related Post: MLB to Test Pace of Game Proposals at Arizona Fall League (10/1/14). Earlier in 2018, Manfred went as far as to threaten adoption of several prior-year AFL experiments—such as the pitch clock—after the Major League Baseball Players Association rejected the Commissioner's offseason pace-of-play proposal in January, having promised pace of play rules changes during an owners' meeting in November 2017. 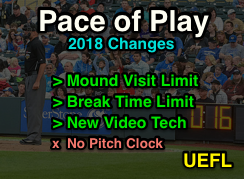 Related Post: Rob Manfred Vows Pace of Play Rules Changes for 2018 (11/16/17). 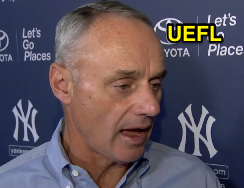 Instead, Manfred opted to forgo the pitch clock for the upcoming season, and instead put the onus of saving time on the players, saying that pitchers' and batters' behavior in 2018 will determine whether or not a pitch clock will be instituted in 2019. Pursuant to the MLBPA-BOC collective bargaining agreement, Manfred as Commissioner possesses the ability and authority to unilaterally institute prior-year AFL experiments, such as the pitch clock. In lieu of the pitch clock, the Commissioner's Office went forward with a six-mound visit limit and changes to the inning break and pitching change clocks. Earlier this spring, in accordance with the new-for-2018 mound visit rules, HP Umpire Jeff Kellogg charged Minnesota with a mound visit after pitcher Phil Hughes left his position on the mound to check on the wellbeing of catcher Mitch Garver after Garver took a foul ball off his mask during a game in late February. No clarification or exemption for catcher injury has thus far been issued.